Being injured in an accident, whether in a motor vehicle accident or at work, can be a frightening experience, especially when someone else is ultimately to blame for your injuries. You may be facing medical bills, lost wages, and other significant expenses, all because of the carelessness of someone else. Fortunately, you and your family may be entitled to seek financial compensation following your injury. At the Personal Injury Group of Morris James LLP, our attorneys and staff understand how difficult it can be to live with an injury. This is why we have dedicated ourselves and our group to protecting our clients and ensuring that they and their families are fairly treated and compensated. 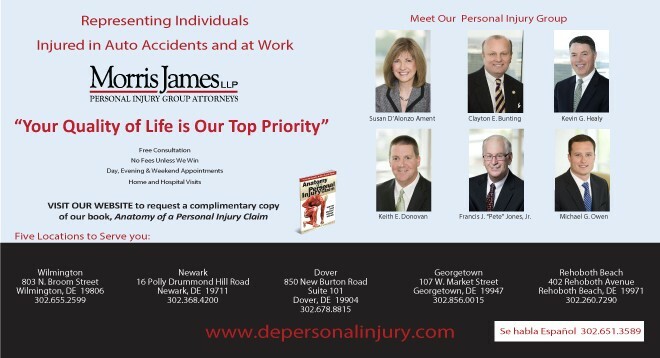 The Morris James Personal Injury Group is comprised of seven attorneys: Susan D’Alonzo Ament, Keith Donovan, Kevin Healy, Francis (Pete) Jones, Clayton E. Bunting, Steven L. Butler and Michael G. Owen who have a combined total of over 150 years of legal experience dealing with litigation related to motor vehicle accidents and Industrial Accident Board litigation experience for clients injured on the job. Our lawyers practice in all Delaware Courts. Certain members of our group are admitted in Pennsylvania and Maryland. Our Morris James Personal Injury Group Manager, Al Ament, is a retired Delaware State Police Officer. When an attorney in the Morris James Personal Injury Group represents you, there is more than an attorney/client relationship formed. There is a personal bond. Our attorneys want to get to know each client in order to be able to effectively communicate and demonstrate the impact your injuries have had on all aspects of your life. For example, we need to understand how the accident and injuries impacted your life, such as pain and suffering, loss of earning capacity, home nursing care or child care. Mainly we need to know what you can’t do now in your activities of daily living that you regularly did before the accident. The Morris James Personal Injury Group attorneys not only litigate, we counsel. We believe an effective personal injury lawyer must keep each and every client well informed and advised throughout each phase of their case. In addition to legal knowledge, we believe compassionate effective communication skills are vital to the attorney/client relationship. Our attorneys are good listeners and all attorneys and their staff respond to client inquiries promptly and respectfully, whether that inquiry is by telephone, e-mail, text, or an in-office visit. Our attorneys are also very active outside the practice of law in community service, having been appointed to many church and community service organization boards. The compassion, understanding, and respect they feel toward clients also drive them to serve their community and others in need. At the conclusion of every personal injury case, our group surveys each client for feedback. We are not afraid to learn what our clients think. On the contrary, we value their opinions. We constantly strive to improve our services. We value client input from one who has gone through the litigation process with us. We believe that person is in the best position to keep us informed regarding their reaction to such things as: office location, support staff, lawyering, technology, etc. We are very proud of the client confidence the Morris James Personal Injury Group has worked so hard to achieve. We know from our past clients’ comments that they benefit from having the advantage of over 150 years of legal experience; the knowledge to anticipate insurance company maneuvers, knowledge of police investigation procedures, and most importantly, caring, professional attorneys who have a personal relationship with each client. We are pleased to report that the majority of our new clients are referred to us by satisfied existing or past clients. We think that shows just how hard each attorney and their staff work to gain the highest level of confidence of every client. If you or a loved one suffers the unfortunate event of a motor vehicle accident or work related accident, the Personal Injury Group Attorneys at Morris James LLP will guide you through the process of obtaining the maximum compensation for your injuries to which you are entitled under the law. With six locations throughout the State of Delaware, we are available to serve you.